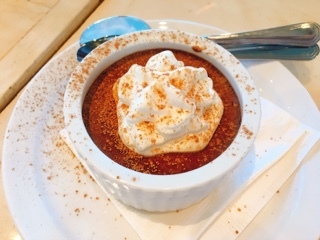 Brickyard Bistro is that neighbourhood restaurant I wish was part of my area. Opened by four friends, after their coffee shop hangout closed, one of the owners (Jesse Hughes) was actually there during our visit and I felt his passion. 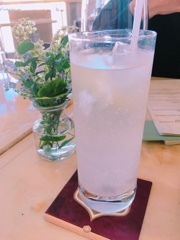 Upon entering, he greeted us warmly and seated us at an Instagramer’s dream table: the coveted marble tabletop adorned with a small vase of flower buds and situated in plenty of natural sunlight. Indeed, it made my Neil the designer cocktail ($10), a light gin and tonic with orange and juniper bitters, look extra refreshing. Next time, I would order a glass of Ontario wine instead (not that the cocktail wasn’t good) - it turns out Jesse grew up in the Niagara-on-the-Lake region, so I’d imagine he has a keen sense of knowing what’s great. Moreover, the wine is reasonably priced from $9-$14 a glass and are even available in 2oz pours if you want to pair by the course. 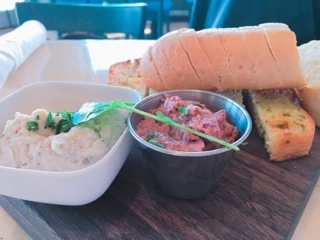 Starting with their bread board ($10), it featured an in-house kale and cheese loaf made by Chef Jason Corey, warmed baguette, and a chipotle and a white bean dips. The warm cheese loaf smells heavenly and although the kale and cheese and flavours were prevalent, the dough needs more salt. Sure, you can add bean dip for flavour, but it’s a shame the bread can’t stand on its own. Sorry there’s no picture, but I didn’t think it’d be worth featuring the bowl of leafy greens ($9). I was wrong, the seedy mustard vinaigrette used to dress the spring mix, cherry tomatoes, and radish was surprisingly tasty. Given it’s not an overly large portion, you could add on an order for some extra vegetables with the bread board. The daily fish ($20) for the evening was an Ontario pickerel – its skin could be crisper but, the fish retained its succulent meatiness. 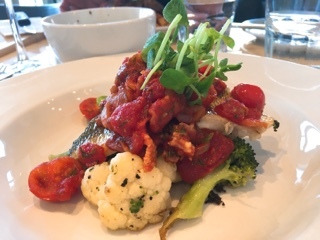 A thick tomato sauce with chunks of bacon topped the pickerel providing an extra richness to the dish. Yet, pairing the protein with all the vegetables kept the dish light. 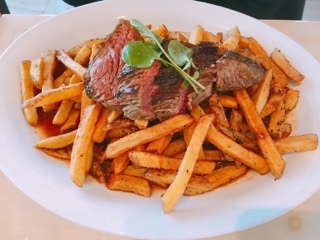 Brickyard Bistro certainly doesn’t skimp on the fries in their steak frites ($21); the plate was covered in them, dwarfing the 6oz steak. Normally, I prefer the frites in a separate pile so they don’t turn mushy, but the coating on these were well done and being soaked in the beefy red wine reduction certainly added extra flavour. Being a French restaurant, I was ready for some rich desserts. 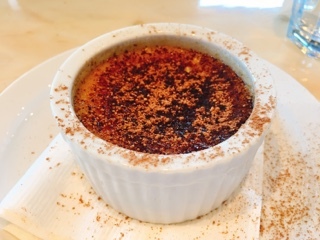 The peanut butter crème bruleé ($6) is fantastic, the peanut butter flavour is prominent while the bruleé sugar crust nice and thin, simply adding a caramel essence. Although by itself the chocolate Amaretto mousse ($6) was too sweet, when combined with the crème bruleé you end up with a fantastic peanut butter and chocolate dessert. Thanks to my friend for suggesting this ingenious idea – make sure you get both. It’s a shame Brickyard Bistro isn’t located uptown or I’d definitely visit on a regular basis. 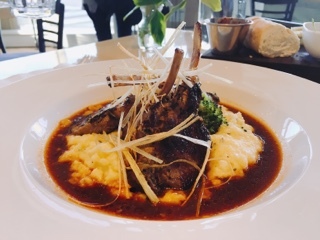 Neighbourhood dwellers, you’re lucky to have the restaurant in your neighbourhood – with reasonable prices, tasty food, and warm service, perhaps it will become a favourite jaunt of your own.